They can detect any powder and granulated material levels in small vessels and hoppers. Strong and fault-free mechanism in a compact body. An all-die-cast aluminum body is used. A special seal system is used. Can be used with wide range of power from 100V AC to 240V AC. A nut-tightening system is employed. An all-die-cast aluminum body is used. The special seal design means you have a strong and fault-free mechanism in a compact body. Multiple power voltages can be used. 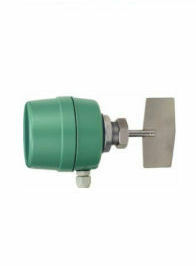 Detects levels of powder and granulated materials in small containers and hoppers.